Diplomate National Board (Anatomy) This shall be recognised medical qualification when granted by National Board of Examinations, New Delhi on or after August 1984. Diplomate National Board (Emergency Medicine) This shall be recognised medical qualification when granted by National Board of Examinations, New Delhi on or after June 2013. Diplomate National Board (Field Epidemiology) This shall be recognised medical qualification when granted by National Board of Examinations, New Delhi on or after December 2012. Diplomate National Board (Immunohematology & Transfusion Medicine) This shall be recognised medical qualification when granted by National Board of Examinations, New Delhi on or after December 2008. Diplomate National Board (Rural Surgery) This shall be recognised medical qualification when granted by National Board of Examinations, New Delhi on or after December 2009. Diplomate National Board (Endocrinology) This shall be recognised medical qualification when granted by National Board of Examinations, New Delhi on or after February 1989. Diplomate National Board (Hematology) This shall be recognised medical qualification when granted by National Board of Examinations, New Delhi on or after December 2010. Diplomate National Board (Medical Genetics) This shall be recognised medical qualification when granted by National Board of Examinations, New Delhi on or after January 2015. Diplomate National Board (Medical Oncology) This shall be recognised medical qualification when granted by National Board of Examinations, New Delhi on or after December 2002. 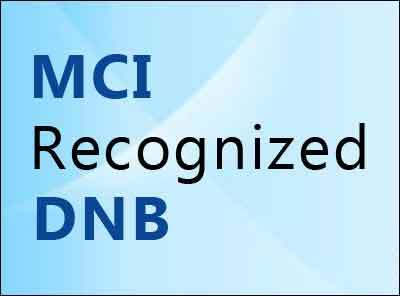 Diplomate National Board (Neonatology) This shall be recognised medical qualification when granted by National Board of Examinations, New Delhi on or after June 2005. Diplomate National Board (Peripheral Vascular Surgery) This shall be recognised medical qualification when granted by National Board of Examinations, New Delhi on or after December 2009. Diplomate National Board (Rheumatology) This shall be recognised medical qualification when granted by National Board of Examinations, New Delhi on or after December 2008. Diplomate National Board (Surgical Gastroenterology) This shall be recognised medical qualification when granted by National Board of Examinations, New Delhi on or after January 2002. Diplomate National Board (Surgical Oncology) This shall be recognised medical qualification when granted by National Board of Examinations, New Delhi on or after December 2006. This shall be recognised medical qualification when granted by National Board of Examinations, New Delhi on or after January 2014. Fellowship National Board (Critical Care Medicine) This shall be recognised medical qualification when granted by National Board of Examinations, New Delhi on or after March 2001. Fellowship National Board (Cardiac Anaesthesia) This shall be recognised medical qualification when granted by National Board of Examinations, New Delhi on or after January 2001. Fellowship National Board (Hand & Micro Surgery) . This shall be recognised medical qualification when granted by National Board of Examinations, New Delhi on or after February 2002. Fellowship National Board (High risk Pregnancy & Perinatology) This shall be recognised medical qualification when granted by National Board of Examinations, New Delhi on or after January 2001. Fellowship National Board (Interventional Cardiology) This shall be recognised medical qualification when granted by National Board of Examinations, New Delhi on or after February 2002. Fellowship National Board (Infectious Disease) This shall be recognised medical qualification when granted by National Board of Examinations, New Delhi on or after February 2008. Fellowship National Board (Laboratory Medicine) This shall be recognised medical qualification when granted by National Board of Examinations, New Delhi on or after December 2006. Fellowship National Board (Minimal Access Surgery) This shall be recognised medical qualification when granted by National Board of Examinations, New Delhi on or after December 2000. Fellowship National Board (Pediatric Cardiology) This shall be recognised medical qualification when granted by National Board of Examinations, New Delhi on or after March 2001. Fellowship National Board (Pediatric Intensive Care) This shall be recognised medical qualification when granted by National Board of Examinations, New Delhi on or after December 2006. Fellowship National Board (Reproductive Medicine) This shall be recognised medical qualification when granted by National Board of Examinations, New Delhi on or after May 2003. Fellowship National Board (Spine Surgery) This shall be recognised medical qualification when granted by National Board of Examinations, New Delhi on or after February 2001. Fellowship National Board (Trauma Care) This shall be recognised medical qualification when granted by National Board of Examinations, New Delhi on or after May 2001. Fellowship National Board (Vitreo Retinal Surgery) This shall be recognised medical qualification when granted by National Board of Examinations, New Delhi on or after March 2001. Fellowship National Board (Paediatric Gastroenterology) This shall be recognised medical qualification when granted by National Board of Examinations, New Delhi on or after January 2014. Fellowship National Board (Sports Medicine) This shall be recognised medical qualification when granted by National Board of Examinations, New Delhi on or after January 2014.